Revolutionary movements that preceded the Communist Party were made up of mainly of former students at Beijing University, a center of political and intellectual dissent after the Qing collapse. 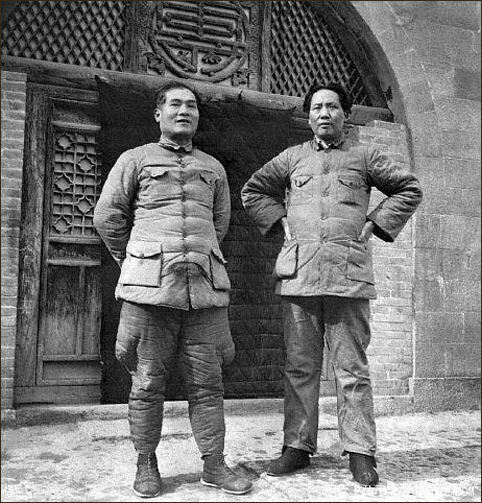 Mao Zedong and Chang Kuo-tao, another pioneering member of China’s Communist movement, were old University of Beijing school chums. The Communist Party's struggle for power took almost 30 years to achieve. Urged on by the Communist International and Russian Communists who had come to China in 1920 after the Bolshevik Revolution, the Chinese Communist Party was created from several Chinese Marxist groups. Communist Party meeting The Chinese Communist Party was formed in Shanghai in July---maybe July 21---1921. Among the 12 delegates at the first Communist Congress was Mao Zedong. In China, the event is known as the "First Supper," and nobody is really sure who else was there, when exactly it took place and what happened. Fearing a raid by French police, the meeting was adjourned after a short time and continued later on a houseboat on the Grand Canal near the town of Jiazing. The main discussion point during the July 1921 meeting, it is said, was whether or not to break ties completely with bourgeois society or form a tactical alliance with merchants and landlords. Ignoring recommendations by two Communist International advisers from Moscow, the Chinese delegates decided to take a radical approach and have nothing to do with capitalism and demand the immediate surrender of land and machinery. Other pioneering members of the fledgling Communist movement in Shanghai included Zhou Enlai, Chang Kuo-tao, and Deng Xiaoping. 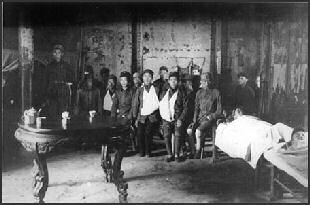 Fearing detection and massacre by the Nationalists under Chiang Kai-shek, the early Chinese Communists met in safe houses in Shanghai. Eventually they were forced out of Shanghai by a joint force of Kuomintang Nationalists and Shanghai gangsters. “Ultimately, the strange story of the wrong founding date of the world’s biggest political party is the result of Mao Zedong’s mistaken memory and the party’s disregard for truth, historians say. While the true date is now recorded in some Chinese history books, to this day most Chinese are unaware of the error and are astonished when they hear of it. The mistake matters, said Zhou Xun, a historian at the University of Hong Kong. “It’s actually rather important,” Ms. Zhou said. “We’re talking about real historical events and real historical truth...This is a good example of how the party makes up all kinds of things, such as events, historical figures, and how they eliminate facts. It’s just a constant thing.” “But for the president of China to stand up and formally say the wrong date, as Mr. Hu did recently, “is pretty amazing, really,” she said. In a collection of autobiographical essays, “Cold Wind Anthology,” published in Shanghai in 1945, Chen Gongbo, a founding delegate from the southern province of Guangdong who, disillusioned, left the party a year after it was founded, wrote dramatically of events at the end of July 1921. Mr. Chen said he shook off a tailing police officer by slipping through a cinema. He returned to his room at the Dadong Hotel, shaken by the narrow escape. “Who knew that barely had one wave passed than another arrived,” he wrote. Hours later, in the early morning of July 31, he heard a gunshot and a scream. Frightened, he opened the door and looked down the corridor but saw nothing. The next morning, a room attendant told Mr. Chen and his wife that a young woman had been murdered in the hotel. They fled to the nearby city of Hangzhou, with Mr. Chen reckoning that he was by now a security risk for the party. A report in the Aug. 1 edition of Shenbao, Shanghai’s leading newspaper, confirms Mr. Chen’s account. In what was apparently a failed murder-suicide, a young man surnamed Zhang shot and killed his female companion in Room No. 32, on the fourth floor, the report said. He left later without paying his bill. Mr. Chen, who followed the case avidly from Hangzhou, wrote that the man had not shot himself, as the couple had agreed. The motive for their pact was a thwarted desire to marry, Mr. Chen wrote, citing Hangzhou newspaper accounts. Mr. Chen never returned to the congress. In 1946 he was executed by the Nationalists for collaborating with the Japanese. As Mr. Zhang wrote in History Reference, the exact date the party congress ended remains a mystery, but the timing of the hotel shooting, at the end of the month, rules out July 1 as the founding date. Mao and Wang Ming In June 2011, Beginning of the Great Revival , a blockbuster movie chronicling the founding of the country's ruling Communist Party was released. The Economist reported: “It opened at every cineplex in China on June 15th, in time for the party’s 90th birthday. Competing films with a shred of drawing power were blocked, even the awful “Transformers 3". Many state-owned firms ordered their staff to attend. Schools organised trips so that pupils could watch and learn from the exploits of a youthful Mao Zedong. Government departments deployed waves of bureaucratic bottoms to fill seats...The film was not, as you might imagine, a piece of government-produced propaganda. It was a piece of for-profit propaganda, produced by the country’s biggest film company, the China Film Group (CFG). Liu Ye played a young Mao Zedong. Actress Tang Wei , who was blacklisted from appearing in Chinese films or on TV for a time, was rehabilitated in time to play Mao Zedong's first love. Lu Chuan and Sheng Ding directed parts of the film besides chief director Huang Jianxin. The cast did not work for free as they had for other Communist Party block busters but receive basic compensation and expenses. A 24-year-old from Beijing told PC World, "On the Web I saw this saying: people are allowed to sing revolutionary songs, but they are not allowed to actually lead a revolution," he said. "Chinese people are not dumb. They understand the humor of all this." "So I think with this film, it won't really have a brain-washing effect. Instead it will have the opposite," he added. "The movie is saying open party politics is crucial. But in reality, China does not have that. From the movie's images, it proves the importance of democracy and having open party politics." A 27-year-old in Beijing, who only wished to give out his surname Jin, agreed. He said he was interested in watching the movie, considering the current political climate of China. "The movie has secret societies, unlawful gatherings, protest demonstrations, and anti-government movements, these are all things that China's Communist Party currently bans," he said. Jin said it was clear the movie's original intention was to brainwash people. But he added, "Ultimately, with a product like this, the creators can only make it, but its up to the viewers to interpret it as how they see fit." 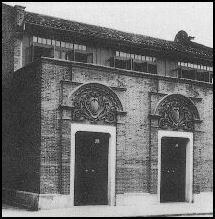 The Communist Party’s main rival and enemy in its early years was the Kuomintang, founded by Song Jiaoren (1882-1913), one of Sun's associates. The party, the Kuomintang (Guomindang or KMT--the National People's Party, frequently referred to as the Nationalist Party), was an amalgamation of small political groups, including Sun's Tongmeng Hui. 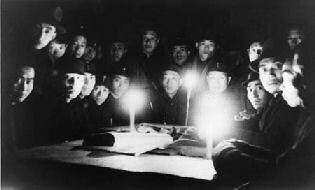 Communist purge in 1927 As the Kuomintang proceeded with the military campaign to unite China — the Northern Expedition — in 1927, Chiang Kai-shek split with the Communist Party and ordered the assassination of Communist Party members. In 1927, shortly after he took control of the Kuomintang, Chiang shocked his Soviet Union allies by purging all Communists from the Kuomintang. He ordered all the Russian advisors to return home, he said, because the Chinese Communists had allegedly plotted to seize the leadership of the Kuomintang. In what later became known as the Shanghai Coup, between 5,000 and 10,000 workers, Communists and left-wing Kuomintang members were massacred. Zhou Enlai barely escaped. 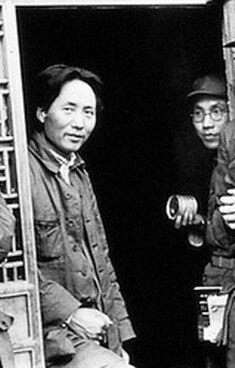 Communist Party founder Li Dazhao was killed by slow strangulation. Attacks were then mounted by the Kuomintang against the Communist in Canton, Changsa and Nanjing. The martyred revolutionary hero Wang Xiaohe was killed. Newspaper photos of him minutes before he was executed, showed him with his head held high smiling. All this drove the main Communist Party leadership underground in Shanghai. Other Communists were forced to set up their operations in the countryside in places like the caves around Guilin and Vieng Xai. Mistaken Ideas also defined the Red Army as a "mass propaganda" (qunzhong xuanchuan) organ in addition to being a military fighting force. It entrenched the absolute leadership position of the Communist Party over the Red Army. The purpose of the Red Army, the resolution stated, "was chiefly for the service of political ends." The resolution further called for the criticism of what was seen as excessive democratic deliberation and discussion in the fighting force ("ultra-democracy"), preferring democratic centralism whereby the minority agreed to abide by the decisions of the majority, lower levels unquestioningly implemented decisions made by the leadership, and that mistaken ideas must be "corrected through ideological criticism. 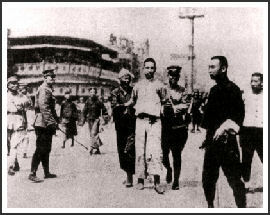 With the 1927 split between the Kuomintang and the Chinese Communist Party (CCP), the CCP began to engage in armed struggle against the Chiang regime. The Red Army was established in 1927, and after a series of uprisings and internal political struggles, the CCP announced the establishment in 1931 of the Chinese Soviet Republic under the chairmanship of Mao in Jiangxi Province in south-central China. After a series of deadly annihilation campaigns by Chiang’s armies, the Red Army and the CCP apparatus broke out of Jiangxi and embarked on their epic 12,500-kilometer Long March of 1934---35 to a new stronghold in Shaanxi Province in the north. During the march, Mao consolidated his hold over the CCP when in 1935 he became chairman, a position he held until his death in 1976. The Chinese Civil War persisted off and on from 1927 to 1950. The Communist Revolution is usually broken down into five periods: the establishment of the Communist Party (1919-21); the first civil war (1924-27), the second civil war (1927-37), the fight against Japan (1937-45) and the third civil war (1945-49). Armed conflict between the Communist Red army and Kuomintang Party began in 1927 when rebel Kuomintang units led by Zhou Enlai staged revolts in several towns, and Mao Zedong led an army of peasants, rebel Kuomintang soldiers and miners in the "Autumn Harvest Uprisings" in Changsa. Mao led the same force through Hunan to the Jinggang mountains on border between Hunan and Jiangxi to begin a guerilla war against the Kuomintang. In 1930 the fighting between the Kuomintang and the Red Army escalated to all out war. In the early stages of the conflict, the Nationalist forces held the upper hand. In the early 1930s the Red Army suffered some costly defeats when Communist leaders abandoned the guerilla tactics that served them well and decided to launch major offensives against towns and cities. When war ended, Stalin’s calculations changed. The Japanese no longer threatened. Soviet armies had occupied Manchuria in the closing days. He intended to keep that rich and strategic northeast territory under his control, something Chiang would never accept. The Communists, by contrast, might play in China the same role they were playing in Eastern Europe, presiding over client states such as East Germany. So Russian railroads and aircraft helped bring Mao’s Communist armies to Manchuria to start building a Red China, while delaying and denying access to Chiang. Chiang scurried diplomatically, making concessions to Moscow in the hope of being allowed at least to partition Manchuria. Thinking he had secured acquiescence, he made the worst miscalculation of his life and threw his best troops into a battle to drive the Communists out of Manchuria. Although this enjoyed substantial success initially, it was... doomed. Stalin would not permit it to succeed. Soviet material and logistic support came to the Communists in Manchuria by rail across the borders (all of which were in Communist hands), by air, even by rail from North Korea, with a full 1,000 railcars being devoted to the task.